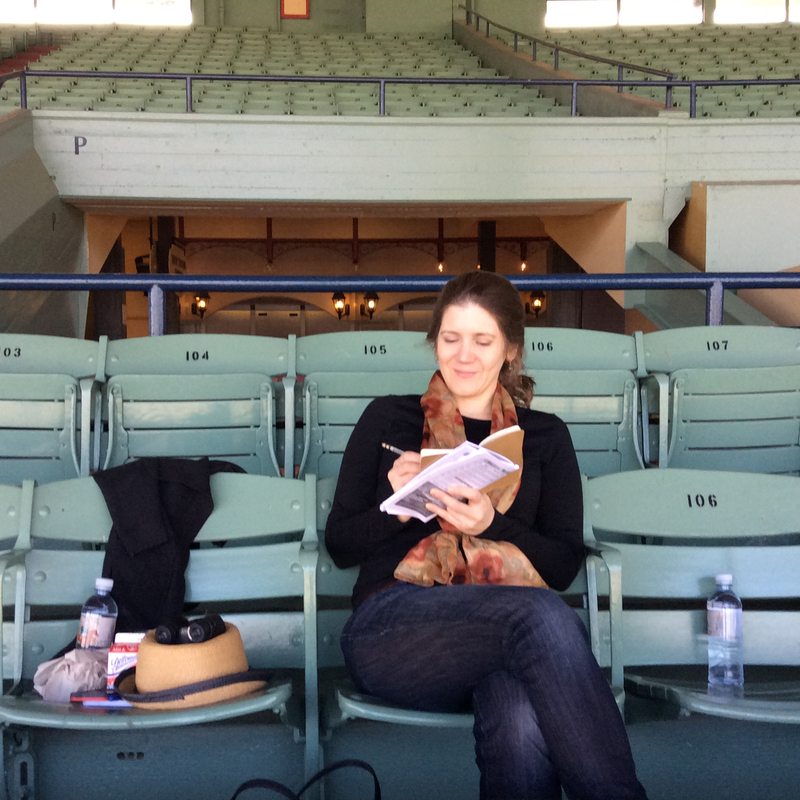 Jen sketching in the grandstands at Santa Anita Racetrack. I’ve been drawing at racetracks for many years, mainly as practice but also because I love the characters and subjects there. Horses are one of the most beautiful and challenging creatures to draw. They’re fluid and full of graceful curves, and the sights at the track are a symphony of color and action. I draw at the track during the races but also enjoy plein air painting in the early morning when the horses are doing their workouts. In addition to my personal project, I’ve also created artwork for The Jockey Club’s racing website “America’s Best Racing” and collaborated with veteran racetrack author John Perrotta on various horse racing related projects. HBO’s “Luck,” which starred Dustin Hoffman and Nick Nolte, barely made it out of the gate before the net’s execs put a bullet into it last year after one season. But the show has lived on in the paints and pens of Brooklyn-based artist Jen Ferguson, with the web series “Out of Luck,” which wraps its run this week. “One of the writers on ‘Luck,’ filmmaker Sherri Bylander, was a fan and collector of my work and gave one of my racetrack pieces to Luck’s creator, David Milch,” Ferguson said, explaining the web series’ genesis. “John Perrotta, a screenwriter and consultant on Luck and professional horse racing expert, saw that work and asked me to work with him when he resurrected the saga online. “Out of Luck,” picks up where Luck — which was axed in controversy over the deaths of horses during production — ended. The storylines, which are provided in script and illustration, “are based on what might have actually happened had the show continued, since Perrotta was a big part of the writing,” Ferguson said. “It’s a dramatic saga that touches on a few distinct groups at the racetrack: the gamblers (“the Degenerates” in Luck), the trainers, owners and racetrack operators, and even the horses themselves. The web series is published at America’s Best Racing, a website created by the Jockey’s Club. Ferguson has also had the opportunity to do other work for the site, including art for the Triple Crown races. For the Belmont Stakes, she said she was inspired by Italian noir poster art. Her interest in the track lgoes back to early childhood, she recalled, when she was obsessed with drawing horses and jockeys out of “The Blood-Horse” magazines she got from her uncle, who owned and raced thoroughbreds. In 2009, she published a book of drawings and stories based on expeditions to Aqueduct titled, “Railbirds: My Life at the Track.” She spent last August working on drawings at Saratoga Race Course and plans to return for the 2013 meet. “I’m interested in creating a new way to portray the thrill and drama of thoroughbred racing,” she noted. “The track is a great place to draw characters; people tend to stay in one place for a while, no one notices I’m drawing them and no one bothers you. In fact, the atmosphere at the track is quite convivial, which seems counterintuitive, but let’s just say that luck is a shared experience. “Nowhere will you experience pathos and empathy the way you will at a racetrack. People are helpful, the track personnel is friendly and you feel like everyone’s on your side, from the courtesy bus driver to the jockeys, to the teller at the betting window,” Ferguson said. “People tend to be doing a lot of math and concentrating in between races, so I don’t feel out of place scribbling madly in my sketchbook. There are lots of places to spread out with your papers (although the new casino at Aqueduct has taken over much of the prized table space, which I’m not happy about). “In addition to all the great drawing you can do inside the grandstand, there’s also the challenge of drawing horses outside in the paddock and on the track — no easy feat. Pardon the pun, but Ferguson has had an illustrious career. Her work spans large-scale oil painting and small sketches and watercolors. She mostly taught herself but she also studied at Pratt Institute and elsewhere. You can find out tons more about her atwww.jenferguson.com. I highly recommend you pay her a virtual visit.